Teeth should be free of cavities—and that might go for proteins, too. Cavities appear in profilin as a result of mutations linked to amyotrophic lateral sclerosis, according to a paper in the Proceedings of the National Academy of Sciences USA this week. The gaps seem to destabilize the protein, making it prone to both degradation and aggregation. Filling this space with a small molecule might fortify the mutant profilin and treat this rare genetic form of ALS, suggest the researchers led by Daryl Bosco at the University of Massachusetts Medical School in Worcester. Profilin controls the assembly of actin filaments. While a little profilin promotes actin polymerization, a lot shuts it down. A handful of profilin mutations have been found in people with inherited ALS, accounting for an estimated 1 to 2 percent of familial cases. Researchers have not yet worked out how profilin mutations cause ALS. However, the mutant proteins tend to aggregate, suggesting to Bosco that they might adopt abnormal, unstable conformations. (See Jul 2012 news; Smith et al., 2015; Van Blitterswijk et al., 2013). First author Sivakumar Boopathy investigated the stability of wild-type profilin and four mutants: cysteine-71-glycine, methionine-114-threonine, glycine-118-valine, and glutamate-117-glycine. According to genetics studies, the first three cause ALS, while E117G seems to be a risk factor (Fratta et al., 2014). Boopathy purified the five different profilins from recombinant E. coli. To analyze profilin stability, he took advantage of the two naturally fluorescing tryptophans in the protein. The wavelength emitted by these amino acids shifts depending on their immediate environment, which reflects the protein’s conformation. As Boopathy added increasing amounts of urea to denature the proteins, the fluorescence peak shifted from about 354 nanometers to almost 366, indicating that the proteins were becoming less folded. C71G uncoiled at the lowest urea concentrations, followed closely by M114T and G118V. E117G withstood higher levels of the denaturant, unfolding at nearly the same urea concentration as the wild-type protein. This indicated that the trio of M114T, C71G, and G118V were less stably folded than the others. In a separate experiment, the same three mutants had melting temperatures at least 10 degrees lower than the wild-type, again indicating their relative instability, while E117G was off by only a few degrees from wild-type. The unstable triad also migrated more slowly than wild-type on a native protein gel, probably because they were unfolded and took up more space. Overall, the results suggested that the profilin mutants that cause ALS were highly unstable, while E117G was only mildly altered. Reasoning that the cell should degrade such proteins, Boopathy analyzed profilin turnover rates in the human neuroblastoma SKNAS cell line transfected with the different mutants. First he treated the cells with cyclohexamide to halt new protein synthesis, then he measured levels of soluble profilin and the insoluble aggregates of C71G, M114T, and G118V. The two pathogenic mutants, C71G and M114T, mostly disappeared within a few hours, suggesting that the proteasome rapidly digested them. The third, G118V, persisted for five hours or more, as did wild-type and E117G profilin. Bosco suspects that malformed profilin can either be directly degraded, or aggregate first. 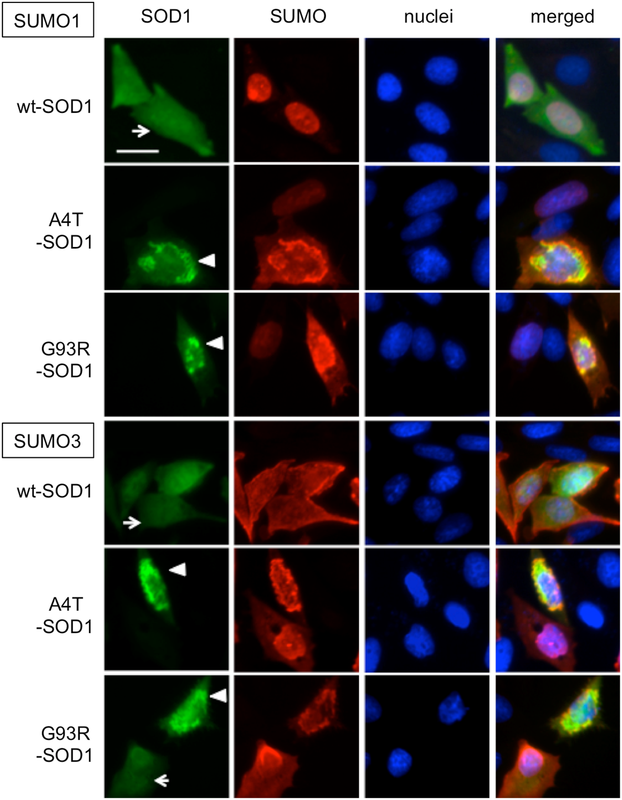 As for G118V, though it was unstable in vitro, cellular factors might have prevented its degradation, the authors speculate. Next, co-first author Tania Silvas tested the mutants for structural variation. She obtained crystals of the wild type, E117G, and M114T. C71G was insoluble and difficult to purify, yielding an insufficient amount to form crystals, and G118V formed poor crystals. In an X-ray analysis, E117G differed slightly from wild-type, but M114T exhibited a major change, in keeping with its instability data. While the wild-type profilin possesses a small cleft at its surface, this was enlarged in M114T (see image above). Using computer modeling, the authors predicted that the C71G protein would have a cavity in the same region, but the location of glycine 118 in a flexible loop made it hard to predict the mutation’s effect on structure. The authors conclude that these cavities likely underlie the instability of the three ALS mutations. “I think [the unstable mutants] are misfolded and targeted for degradation,” Bosco said. Exactly what that instability does to motor neurons in people with ALS remains a mystery. “It is possible that [profilin instability] underlies the disease, either through a gain of toxic function or a loss of function,” Bosco said. What about E117G? “E117G shows a similar trend on protein structure and stability to the pathogenic mutations, but with a more subtle effect. These observations fit exactly with what you would expect from a risk factor,” Julie van der Zee at the VIB University of Antwerp, Belgium, wrote to Alzforum. Van der Zee was not involved in the study. If these unstable mutants have a hole, the authors reason, then plugging it with a small molecule might help. This kind of “pharmacological chaperone” approach looks promising for other proteins involved in diseases such as cystic fibrosis, noted Gregory Petsko of Weill Cornell Medical College in New York (Leidenheimer and Ryder, 2014; Aymami et al., 2013; Hanrahan et al., 2013). “Anything that will hold the protein’s structure together should work,” Petsko said. Bosco and colleagues are already hunting for small molecules that might shore up the wobbly profilins. Could such drugs help more than the small group of people carrying those mutations? “You never know,” Petsko said. If profilin participates in ALS-related pathways, stabilizing the wild-type version might be beneficial, he speculated. He suggested testing this question by overexpressing profilin in cells derived from people with ALS. The question remains: How does unstable profilin instigate ALS? Matthew Figley of Stanford University, who was not involved in the study, wondered about the downstream consequences of unstable profilin. Bosco’s group has already nixed two possibilities, namely that mutants would be unable to bind actin or other binding partners. The mutants bound actin just fine. As for the binding partners, many interface with profilin via a poly-proline motif, and the mutant profilins had no trouble capturing poly-proline in his assays. Bosco plans to look at other profilin-binding proteins and actin dynamics in cells with mutant profilin to figure out its downstream effects. Boopathy S, Silvas TV, Tischbein M, Jansen S, Shandilya SM, Zitzewitz JA, Landers JE, Goode BL, Schiffer CA, Bosco DA. 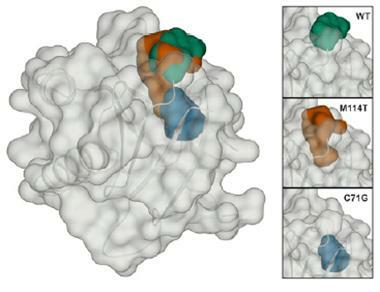 Structural basis for mutation-induced destabilization of profilin 1 in ALS. Proc Natl Acad Sci U S A. 2015 Jun 8; PubMed.